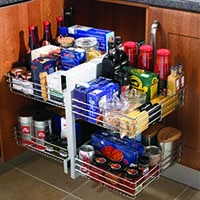 The Blind Corner Optimiser provides a practical solution to maximising useable storage space in blind corner base units, able to store up to 40kg of kitchen equipment and foodstuffs – installation is fast and simple, making this product perfect for fitting into existing kitchen cabinets. The end result of this product is: clutter free workspaces, easy access kitchen items and increased storage space – meaning you don’t have to clamber around reaching into the back of awkward cupboard spaces. If you have any questions about our corner optimisers, or how they can enhance your kitchen, just get in touch and we will be happy to assist you.